Our new Voodoo13 High Clearance Rear Toe Arms for the Nissan Skyline 99-02 R34 RWD offers superior subframe clearance for extremely low cars. Many aftermarket toe rods with a straight profile tend to collide with the subframe at extreme ride heights. Our unique and innovative design features a curvature for increased clearance between the subframe and the arm. The main body is CNC machined from 6061-T6 aluminum. The mounting location to the hub is integrated into the arm itself to distribute the weight towards the sprung side. This means less unsprung weight and better overall suspension performance. 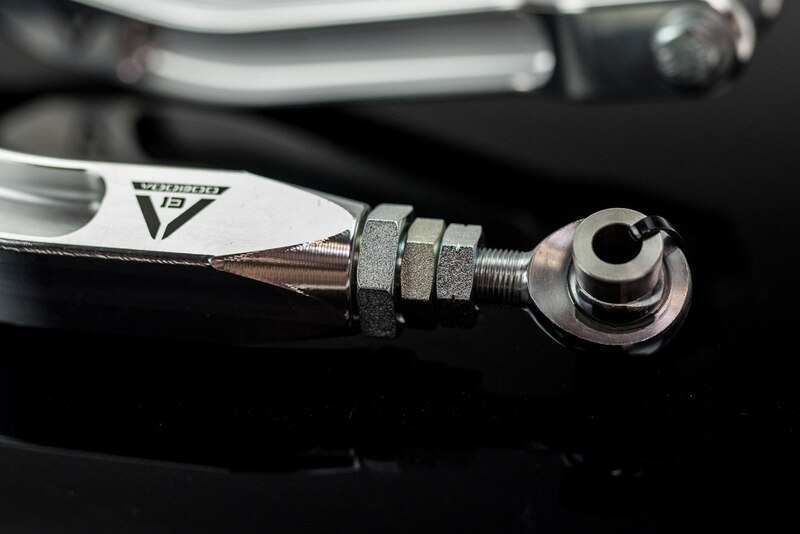 Adjustments are made easily via our signature chromoly adjusters with QA1 rod ends. USA made QA1 XM series Chromoly Steel heim joints are heat treated for strength and durability. The spherical rod end is completely self-sealing and self-lubricated because of their Nylon/PTFE injection molded race that keeps dirt and debris out.